F/Lt Don Andrews, flight commander of No. 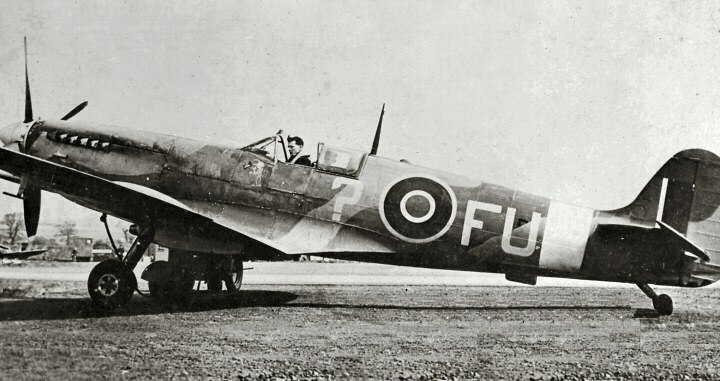 453 Squadron RAAF, in the cockpit of his Spitfire Mk. IXC, serial number unknown. Establishing the date of the photo without the serial number isn’t easy, but it has been established that the previous FU-?, Mk. VC EE727 crashed on approach to the airfield on 13 September that year killing the pilot. On the other hand, a month later (15 October) the squadron moved to Skeabrae in the Orkneys. This would time the photo to September-October 1943 in in Perranporth, Cornwall. 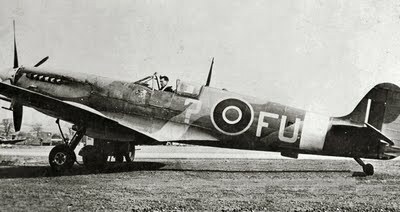 At the time the unit used a mixture of Spitfires Mk. IX and Mk. V for convoy patrol and anti-shipping operations. Don Andrews’ personal emblem was a Gremlin logo in front of the cockpit. Watch for the forthcoming story about Don Andrews’ career as Spitfire pilot in our collection of Articles. The article on Don Andrews has made Don a very contented fellow, he will be delighted to see that this is published by teh Spitfire Site. Don is a q quiet retiring man but obviously a bit of a gun slinger in his youth… Don is now residing in a Nursing Home in Sydney and although frail is still very sharp mentally. If you woudl like to drop Don a line contact us at the Spitfire Association. Don is my uncle, eldest brother of 3 siblings.My mother Marjorie Annette Weston new Andrews, passed in 1981 . And over the yrs I’ve lost contact and last saw Don and his devoted wife Ainsley Andrews new Noble, and their daughter Jill – my cousin … this was at my fathers funeral 8 yrs ago I would dearly like to make contact with the family and would greatly appreciate if u could pass on this message, or pass on to me a contact. My number 0412 024 814 , currently living at Mirand in Sydney . I dearly hope that he hasn’t passed also my Aunt Ainsley who appeared to be in robust health at Dad’s funeral . Yours sincerely Craig Weston.. I wonder if you could please send my contact details to Don. My father (John Olver) was in 453 Squadron with Don and I have lost contact with him since dad died. Don was also best man at my parents wedding. I can be contacted on 0412443142.